Two shrub species (Piliostigma reticulatum (D.C.) Hochst (Caesalpinioideae) and Guiera senegalensis J.F. Gmel (Combretaceae) are commonly found in farmers’ fields at varying densities in semi-arid Senegal and throughout the Sahel where soils have chronically low phosphorus (P) availability. 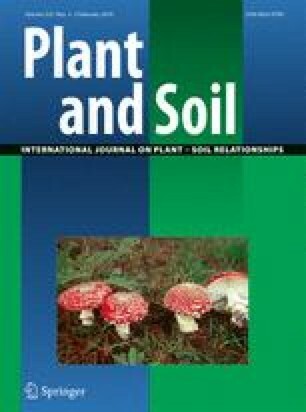 It seems plausible that shrub litter and the rhizospheres could influence P fractions and other chemical soil properties that affect crop productivity. Thus, a study was done at two sites, on the distribution of inorganic and organic soil P pools, organic C levels, and pH in soil beneath and outside the canopies of P. reticulatum and G. senegalensis (0-30 cm depth). Both sites had low total P ranging from 64 mg P kg−1 to 135 mg P kg-1, and low extractable PO4 (resin Pi) (1–6 mg P kg−1) with P fractions dominated by NaOH-P. Organic P (Po) made up about 50% of total P, and most of the organic P (>60%) was found in the NaOH-P fractions. The labile P, particularly bicarb-Po was higher in soil beneath shrub canopies (8.4 mg P kg −1), than outside the canopy (6.2 mg P kg −1). Similarly, C, N and P to a lesser extent, were more concentrated beneath shrub canopies. P. reticulatum soil was dominated by the NaOH-Po fraction, whereas G. senegalensis had higher bicarb-Po at one of the study sites. An index of biologically available organic P (Bicarb-Po) / (Bicarb-Po + Bicar-Pi + Resin Pi) was > 60% and indicates that biological processes represent an important part of P cycling in these shrub ecosystems. The differential ability of shrubs in modifying soil chemical properties under their canopies has major implications for biogeochemical cycling of nutrients and C in sandy soils of semi arid Sahelian ecosystems. This study was conducted as part of the Coupled Biogeochemical Cycles/Biocomplexity Grant No. 0120732 funded by the National Science Foundation. The authors wish to thank the following people: Pape Omar Dieye, El Hadj Moussa Diop, Younouss Tamba, Mohr Fall and Mahecor Diouf for their assistance in data collection and labwork; Dr. Ibrahima Diedhiou for helping with description of herbaceous vegetation between shrub stands; Joan Sandeno for editorial comments; Dr. Cliff Pereira for statistical assistance; Dr. Kate Lajtha for graciously providing the anion resin strips; Dr. Fred Kizito for providing the bulk density data.